Background: Papaya (Carica papaya) is well known for its medicinal properties as well as its use in traditional system of medicine. The recent rise in the knowledge of medicinal properties of papaya has significantly contributed to the modern pharmaceutical industries. 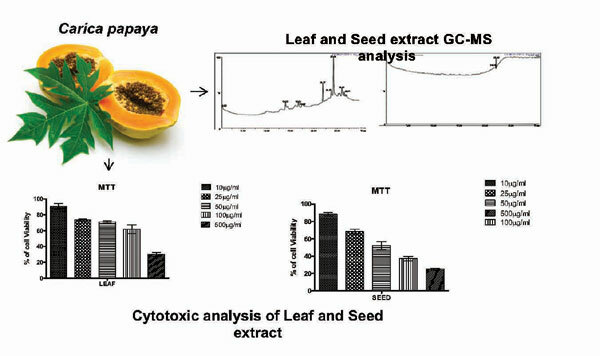 Objectives: In this study, methanolic extracts of papaya leaves, un-ripened peels and seeds were studied for their phytochemical composition, antioxidant, anti-inflammatory, antidiabetic and anticancer properties. Methods: Bioactive compounds were identified using GC-MS analysis. The antioxidant effects of extracts were estimated by radical scavenging assay. In vitro anti-inflammatory activity was estimated by human red blood cell membrane stabilisation method. Antidiabetic activity of extracts was determined by α-amylase inhibition method. The viability of cells was assessed by MTT assay using MCF-7 and vero cell lines. Results: The free radical scavenging activity of methanolic extracts of leaf was found to be 67.78%, un-ripened peel 77.47%, and 90.12% at 1.0 mg/mL concentration. The percentage protection was calculated to be 75.87%, 91.25% and 88.25% and percentage hemolysis was calculated to be 24.12%, 8.75% and 11.75% of leaf, un-ripened peel and seed extract respectively. α-amylase inhibition (antidiabetic activity) of 86.93%, 62.16% and 59.90% was estimated in methanolic leaf, unripened peel, and seed extract respectively. In methanolic seed extract, the cell viability at 500 µg/mL concentration was 25.29%, the extract lysed 74.70% MCF-7 cells with IC50 lysis value of 183.48 µg/mL. Conclusion: From the results obtained in the present study, it can be concluded that the leaf extracts showed potential antidiabetic and anti-inflammatory activities. Peel extracts have high anti-oxidant & anti-inflammatory activity and seed extracts showed higher level of MCF-7 cell line inhibition. Keywords: Carica papaya, antioxidant, anti-inflammatory, antidiabetic, anticancer, squalene, tocopherols. Keywords:Carica papaya, antioxidant, anti-inflammatory, antidiabetic, anticancer, squalene, tocopherols. Abstract:Background: Papaya (Carica papaya) is well known for its medicinal properties as well as its use in traditional system of medicine. The recent rise in the knowledge of medicinal properties of papaya has significantly contributed to the modern pharmaceutical industries.